Forms must be completed and returned to SML's main office ahead of your arrival. Research leaders may elect to collect forms from participants and provide to SML as a group package. Visiting researchers will not be permitted to board SML vessels without signed release forms. Forms Packet, click to view/print packet. Emergency Contact and Health Form – indicate allergies to medicine or foods, and other special needs. Multimedia Agreement and Release Form – please alert SML staff if permission to take photo/video is not granted. Suggested packing list. Please note: supplies for your research are not included in this general list. Researchers are responsible for their own equipment and supplies. Shoals Marine Laboratory is a member of the American Academy of Underwater Sciences (AAUS). 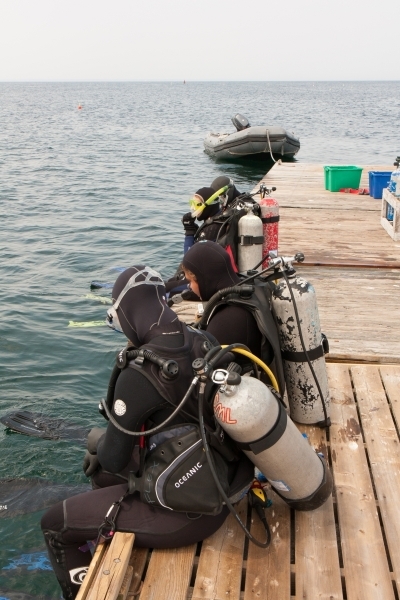 Forms must be returned to SML's Diving Safety Officer, Becca Toppin. Instructions for submission of forms can be found on page 1 of the packet. SML's Diving Safety Officer (DSO), Becca Toppin, is responsible for approving SCUBA Diving Research Applications. Contact Becca Toppin with questions.